Hardcover, vollfarbig. Din A4, 192 Seiten. Clash of Empires is the tabletop wargaming rules for the ancient to medieval periods from Great Escape Games. CoE is a full colour, hardcover book priced at £25. From its release in April 2011, CoE has been fully supported with army lists on our website. Some key features are detailed below and the site contains lots of information and free, downloadable pdf's. Use the buttons on the left of this page to navigate different areas. The Army Lists section contains dozens of free pdf's subdivided by historical periods. The Rules page contains a pdf preview, battle reports, army building articles, reference sheets, errata and optional rules. Age of Ravens and Rise and Fall of Persia contain briefs and pdf previews on those CoE source books. The Hobby Blog details modelling and painting projects that we are working on and will develop into a useful archive of tips and tutorials. The Forum button leads to the Great Escape Games message board where you can ask rules or hobby questions, find opponents and entertain us with tales of you ineptitude with dice! And the Events page details some of the upcoming CoE events; if you know of any others that are taking place then drop us an email and we'll post the details. We mainly play with 28mm figures but the rules are adaptable to 15mm and 20mm armies as well. For a typical sized game of CoE, number of models will vary by army ? our own Carthaginian army has 155 men and our Early Imperial Roman army has 125 men. There are plenty of dice to roll. The turn sequence is: Orders Phase, Movement Phase, Shooting Phase, Hand-to-hand Phase and Combat Outcomes Phase. Troops? profiles are: Movement Rate; Shoot; Attacks; Hand-to-Hand; Defence; Kill; Hits; Discipline; Morale. Troop morale is vital but troop discipline is a separate characteristic and can be just as important. Units have profiles to determine how good they are but may also have Unit Special Rules such as Cantabrian Circle (Skythians), Expert Swordsmen (e.g. Legionaries) and Shieldwall (e.g. Saxon infantry) to name a few. Different weapons are well represented according to their historical uses - the pilum is used as a thrown weapon before combat disrupting the enemy formation, and the pike enables more attacks but suffers if the unit is pushed back in combat. Army lists are very expansive and you choose your unit size by individual models within set minimums and maximums (e.g. a Roman auxiliary infantry unit has 10-30 models in it). Units within the army list are 'flavoured' for that period so that a Roman Legionary is different to a Viking Hirdman, rather than both being superior Heavy Infantry. Generals and other characters command, they are not super killing machines. This can be a good excuse to do diorama bases for your leaders if you are so inclined. Clash of Empires even has a use for those casualty figures you never painted! 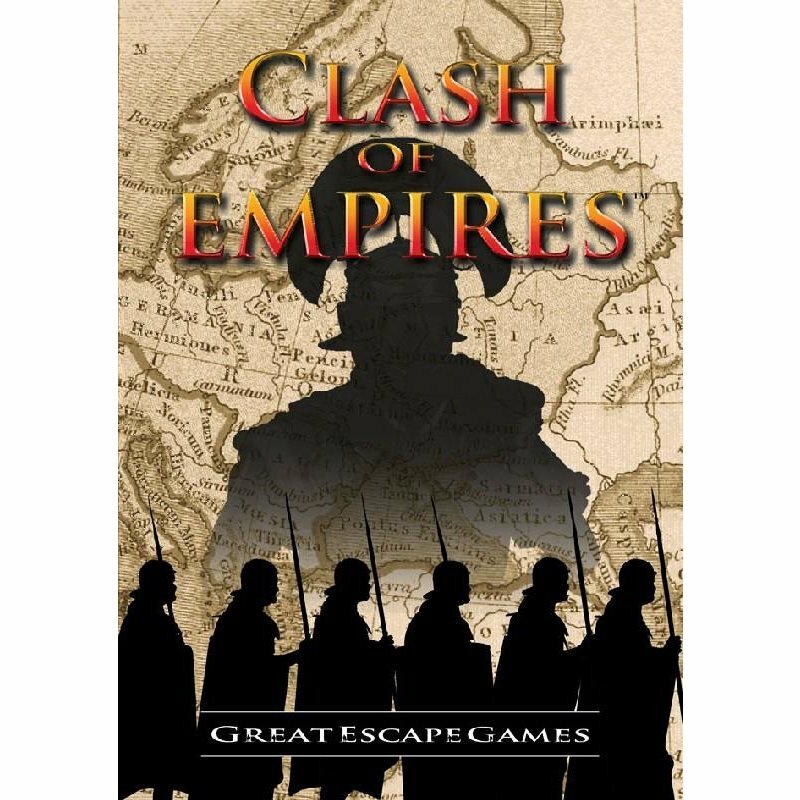 In the rulebook are lists for the Early Imperial Romans and its enemies in the west ? Ancient Germans, Ancient British, Caledonians and Dacians. The first army list source book is Rise and Fall of Persia, covering Early Achaemenid Persia to the death of Alexander. The second, Age of Ravens, covers the Viking era and the war in Spain. See the links on the left for more. Many army lists will be free to download from the web. They will be official but will be living lists reviewed by us and the wargaming community. Some of these will go to print but many will stay on the website as free downloads. The rulebook also contains rules for four different scenarios including elements such as terrain placement, terrain types, army initiative and flanking manoeuvres. If you're reading this page for the first time and want to know more, the links on the left lead to other areas of the hobby related to CoE. These include hobby articles on everything from guides for painting miniatures, a look at our various armies, hobby articles on making scenery, a huge selection of free downloadable army lists and more. You can also find a selection of battle reports giving you an idea of how a CoE game plays out and a lot of other information to help get you playing games. ?Men grow tired of sleep, love, singing and dancing sooner than war. ?